Password Manager Pro (PMP) provides the option to integrate with ManageEngine Service Desk Plus's configuration management database (CMDB). This integration enables you to export SSL certificate details from PMP's repository to Service Desk Plus's CMDB thereby allowing administrators to monitor the usage, expiry and other aspects of SSL certificates across the organization directly from Service Desk Plus interface. To export SSL certificates from Password Manager Pro (PMP) to Service Desk Plus's (SDP) CMDB, you have to first provide the server details where SDP instance is running and the user account details (technician key). Once the integration takes effect, a new parent CI type and a corresponding child CI type will be created in Service Desk Plus which will house all the certificates exported from PMP's repository. You can also export SSL certificates from Password Manager Pro into an already existing CI type in SDP by appropriately mapping the certificate attributes to that of the existing CI. 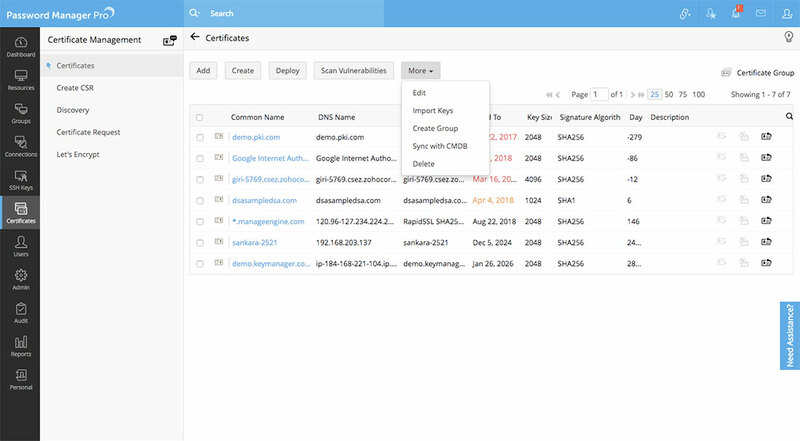 Exporting certificates into CMDB renders visibility over SSL environment and allows administrators manage all IT assets from a single, central repository. Prerequisite : Before proceeding to set up CMDB integration, Password Manager Pro requires the details of the server in which ServiceDesk Plus is running and the technician key. 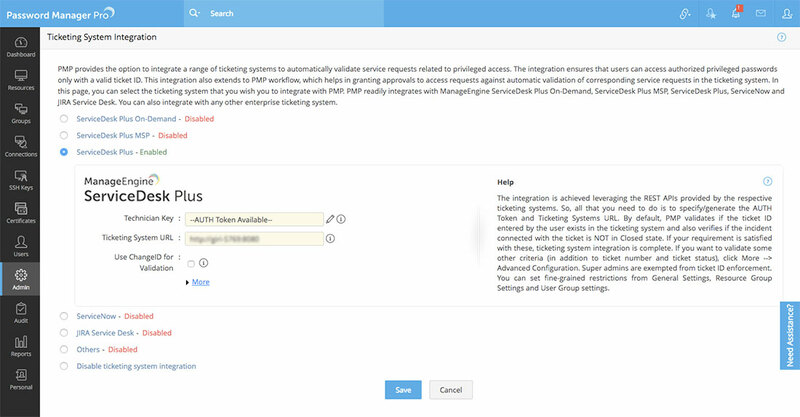 To provide the above details, go to Admin >> Integration >> Ticketing System Integration. In the page that loads, enable ServiceDesk Plus integration and enter the details. The technician key should be generated from SDP's interface and the user account for which the key is generated should have SDAdmin privilege in SDP. For more details about the key generation, click here. 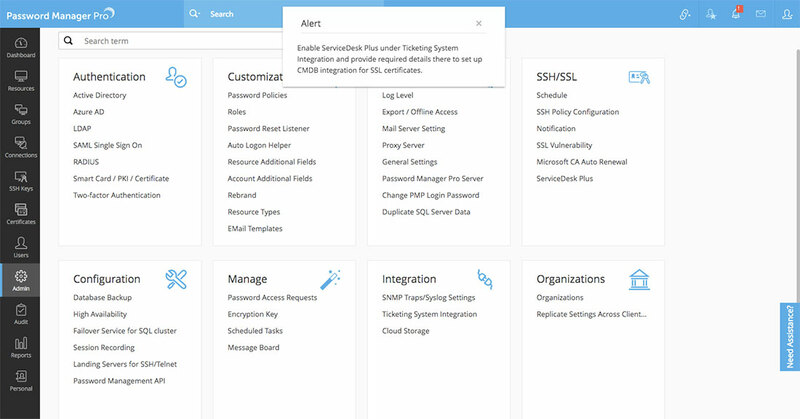 Navigate to Admin >> SSH/SSL >> CMDB Integration in Password Manager Pro's interface. In the dialog box that opens, click 'Enable' beside Certificate Sync option. You can either choose to create a new configuration item (CI) type in SDP or export certificates into an already existing CI type. To create a new CI type, select 'Create New CI Type' option, provide a name for the CI type and an optional parent CI name. By default, child CI type PMP_SSL is created under the parent CI type Password Manager Pro. You can choose to modify the names according to your requirements. Click Save. 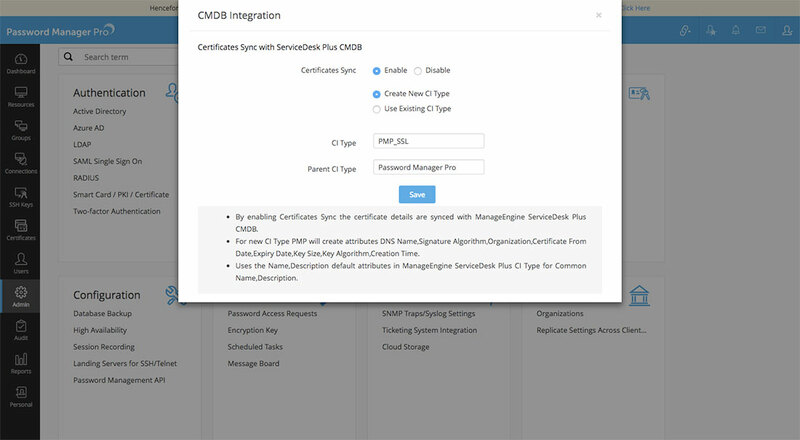 A new CI type in created in SDP's CMDB consisting of the following attributes: Common name, DNS name, signature algorithm, organization, certificate from date, expiry date, key size, key algorithm, creation time and description. All the SSL certificates from Password Manager Pro's repository will them be exported to SDP's CMDB. To export certificates into an already existing CI type in SDP, select Use Existing CI Type option and specify its name. Click Fetch attributes to fetch the attributes of the existing CI type. You then have to map the certificate attributes available in Password Manager Pro (common name, DNS name etc.,) with the attributes of the chosen CI type by choosing appropriate options from the Select Attribute drop-down. After the mapping is done, click Save. All the certificates from Password Manager Pro's repository will be exported to SDP's CMDB. 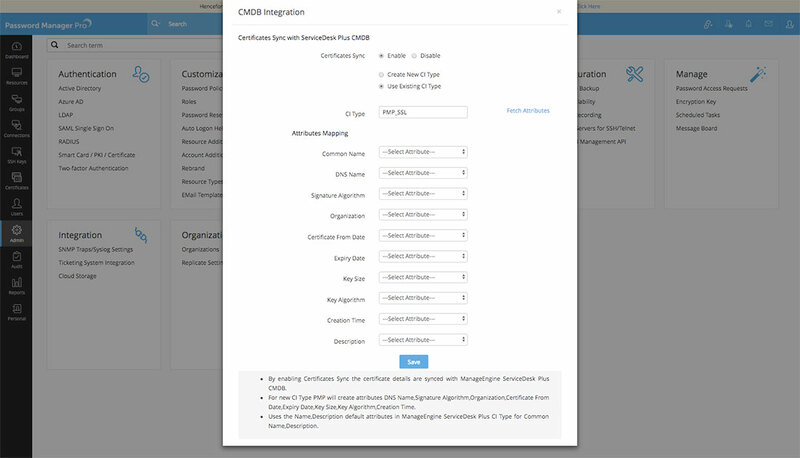 Navigate to SSH/SSL >> CMDB Integration in Password Manager Pro's interface. Switch to CMDB tab and click 'Enable' besides Certificates Sync. All certificates in Password Manager Pro are synced with SDP's CMDB. Also, certificates that are added to Password Manager Pro in future will be automatically exported and synchronized with SDP's CMDB. Click the More option available above the table view and select 'Sync with CMDB' from the dropdown menu. All the certificates in PMP's repository will be synced with SDP's CMDB. Similarly, when you delete unwanted certificates from Password Manager Pro's repository, the certificate gets deleted from SDP's CMDB also. Select the certificate(s) that you wish to delete. Click the More option available above the table view and select Delete from the dropdown menu. 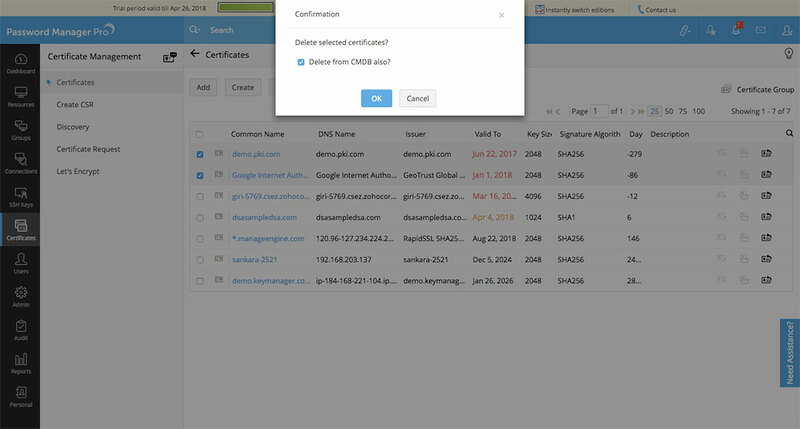 A dialog box will appear asking you to confirm the deletion of certificate from CMDB also. Enable the check-box and click OK. The selected certificates are deleted from Password Manager Pro and SDP's CMDB.